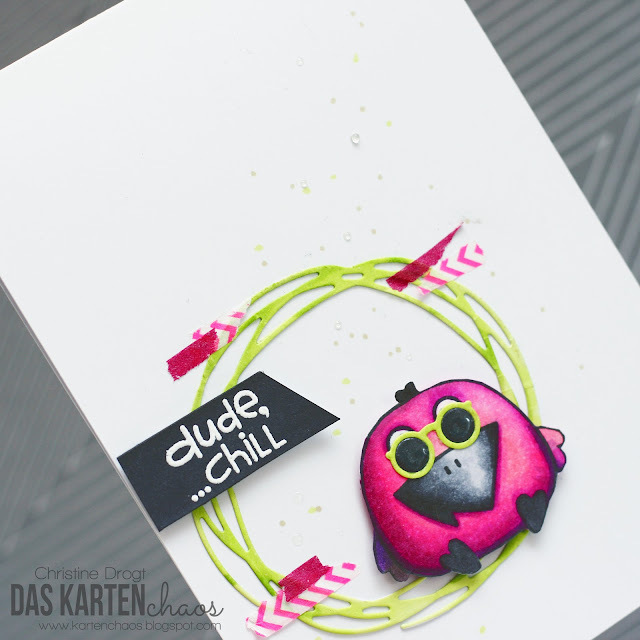 This is the Color challenge by Bastel-Traum.at that I used - isn't that lovely? This is so cute!! I LOVe the coloring on this and the sunglasses ROCK. I also like the tiny pieces of Washi tape you used. FABULOUS design!! Ha, ich kann es nicht glauben, dass wir tatsächlich BEIDE eine Farbkombi ausgesucht haben, wo kein Türkis drin vorkommt! Dein Vogel sieht so unglaublich cool mit seiner Sonnenbrille aus, dass ich ganz neidisch bin! This is amazing!!!!!!! Totally wouldn't have thought you would pick this cope challenge- it's AWESOME though!!! Love that cool bird!!!! Love the die!!! Awesome!! Very cool and fun card. Can you share a link to the scribble circle die you used? I saw your card featured on the Paper Smooches FB page [https://www.facebook.com/PaperSmooches] as one of our "FB Featured Players" from the September Anything Goes (wk1) challenge--- congrats!